Hey, Is That Chair Affair Seat Taken? Yes! In the blink of an eye, with the single word SOLD, custom-made chairs and other designer wares were disappearing. It was all part of the fun at this year’s Chair Affair where each sold item offers new hope to people in need. The Furniture Bank is 20 years-old! This is the 20th anniversary of The Furniture Bank, a Toronto charity that collects used furniture to then transfer to families transitioning out of homelessness or displacement. Last year over 10,000 people in the GTA were able to turn their space into a home with help from people like you. 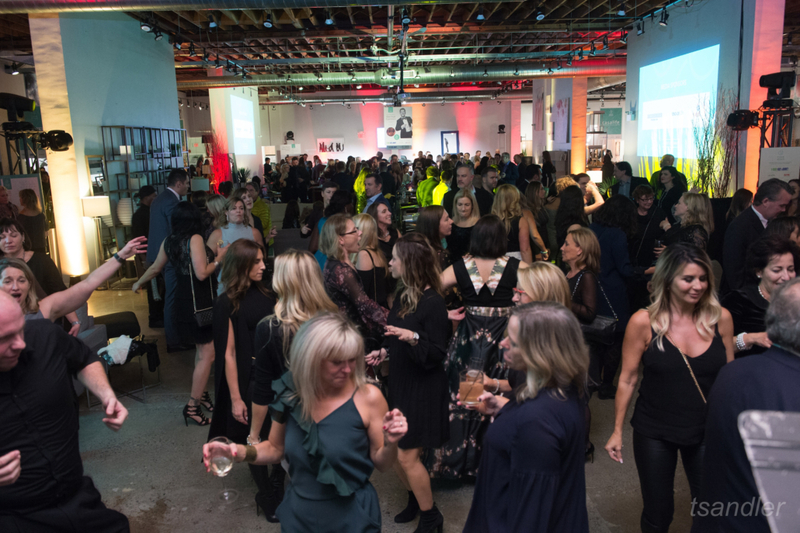 As their premiere fund-raising gala and silent (and not so silent) auction, the event brings designers and design enthusiasts together. 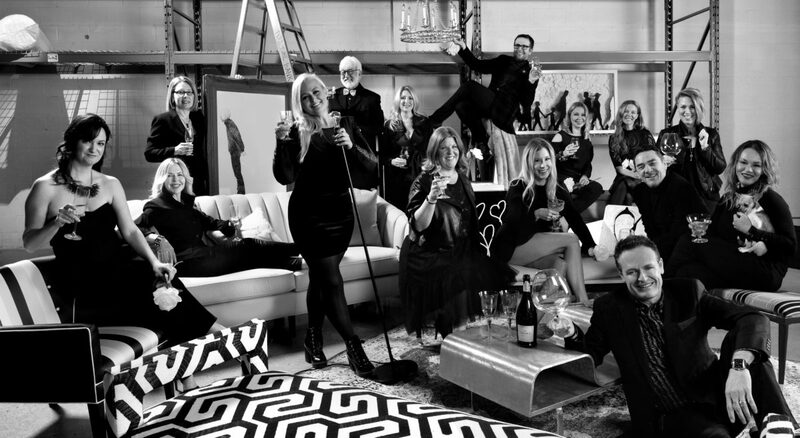 The Chair Affair invites attendees to dress up glamorous and a little flirty and help raise money while enjoying an evening of fun, food, music, and great finds. Chef Michael Smith comes in from PEI to show off the year’s best seafood (oysters!) from the Maritimes and there are many food stations throughout the beautiful Casa Life location to enjoy. The event was hosted by Todd Talbot from HGTV’s Love It Or List It Vancouver, and Matt Dusk provided the music. An event like this takes a lot of planning. The designers involved were approached in the summer by Chair Affair committee design liaison, Cori Halpern. Her request? Contribute a custom made, upcycled piece, not necessarily a chair. Many rose to the challenge by contributing a variety of unexpected, creative pieces like re-imagined cabinetry, benches and more. You can see some of their results in the photo. DIY Guy, Nicholas Rosaci, (hanging on to the chandelier) suggested a Vanity Fair style photo shoot. He brought out his inner Annie Leibovitz and styled the group and their contributions for the photographer, Larry Arnal. I’m so humbled to be included with these designers! Seeing everyone’s pieces together was so much fun, I have to tell you about some of them. Desta Ostapyk took a plain bathroom vanity and jazzed it up with brilliant white, hand drawn hearts set on a black background. Jo Alcorn hand-painted her chair into a one-of-a-kind work of art and Hollie Cooper’s bench was a study in restrained glam, literally. Belts were tied to section off the seat cushion on this coffee table transformed into a bench. Dainty, but sturdy gold wheels gave it mobility. Some of the designers upcycled pieces ready to be auctioned. There was a lot of black and white contrast in chairs, framed art and furniture and one colourful standout from Jim Connelly. His bentwood coffee table was given an iridescent finish a little like abalone in a seashell. Altogether the collection looked so glamorous and sophisticated you’d never know it was all upcycled. I want to thank the very talented people from the Furniture Bank who quietly make it all happen every year. People like Tammy Peddle, Catriona Delaney, and Andrew Clendeninneng are a joy to work with. And please remember to think twice about that piece of furniture you no longer need. It can change a life. Visit Furniture Bank online or call (416) 934-1229.